Have I told you about my new favorite addiction? I can’t get enough of the new platform Periscope! Periscope is all about engagement. Engagement and using social media for authentic social selling has been my biggest belief and something I have staked my business on since I started. Twitter and LinkedIn won’t have be jealous though because there are many ways to integrate these three platforms together to make an intensely strong marketing strategy that will engage your customers and bring you business. Find out what Periscope can do for you! But first, let’s talk about my new love, Periscope, why I love it and what this platform can do for you! Your audience can ask you questions and you can answer back. This is a perfect way to engage your audience, show that you value their time, and showcase that you do know what you are talking about. Really dive deep here into your presentation you never know where a question might take you. Your videos can be viewed for 24 hours. So simple to capture the people in your niche who are busy at the time of your Periscope video. WIth a 24 hour window you have the option to promote it to different social media sites several times and make sure those on the other side of the globe from you can watch it in their own comfortable time zone. AND, if you’ve saved the video to your device, you can repurpose all over the place. The Twitter icon that you can turn on before you broadcast. This simple feature allows you to auto-tweet out to your Twitter profile notifying your followers that you are broadcasting on Periscope. Such an easy way to connect two of my favorite platforms. Remember in my recent blog regarding ideas for posting to Facebook? (Read it here) Well Periscope brings you the ability to show a behind the scenes day in the life of your team, of your work, maybe even a peek into your personal life if that is something that will spark interest for your prospect clients and followers. I know in the social media world a lot of the people I work with want to know my systems for everyday social media posting. It’s so easy now to walk them through my office where I can step-by-step them through my process as I work! Periscope highlights the mundane and makes it valuable. You know most of life is the mundane day to day business we have to get through, highlighted by the more poignant memories we cherish. I firmly believe mundane is not bad. I do a lot of the same things over and over again every day and so I’ve become an expert at them in my field. I love taking those mundane moments and making them more exciting, more educational, and more valuable to me and my audience. And you can too. What in your life would you like to pass on and move from mundane to memorable? I love the “hearts” feature. I admit it. I think this is such a clever feature of the Periscope application. This hearts feature I’m referring to allows your viewers to tap on the screen and send heart icons when something is happening that they are “applauding” or approving of. It is such a small gesture, similar to a “like” on Facebook, but so fun and unique. This makes using Periscope that much more interesting to me. Want to send me some hearts?! I would love it! Your title is worth everything. Think of your headline in a blog post, your headline in LinkedIn, your URL, SEO, everything all rolled into one. That is what your title does for your Periscope viewing audience. Be sure to think about this one a little bit. And use emojis! Make it fun. To unique and interesting: Social Selling: I get 100 viewers I’ll Do the Worm. The Periscope audience does not expect a professional video. What a relief! Be sure you take note of background noise and other distractions but aside from that all have at it and have fun! Periscope users know that this is a livestream and thus the bar is set fairly low. There is a lot of forgiveness on Periscope as it is a new platform and just starting to emerge as a major player in the world of social media. I’m sure in the future there will be Periscope videos out there that rival the pro’s, but for now, it’s you and me and our home offices, and I will take full advantage of that! 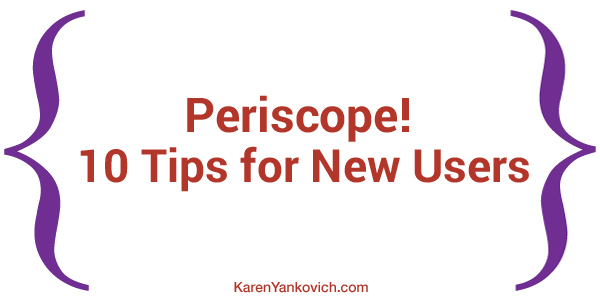 Looking to start out on Periscope but want to make sure you have a few viewers that tune in? Join my LinkedIn group and let us know! We will be glad to come and support you! Follow me on Periscope here! And watch the replays at katch.me/karenyankovich. Thx for sharing. I have been checking it out but not broadcast yet. Great platform to share on Live. Thank you for your Insite Karen.